Are roses your favorite flower? 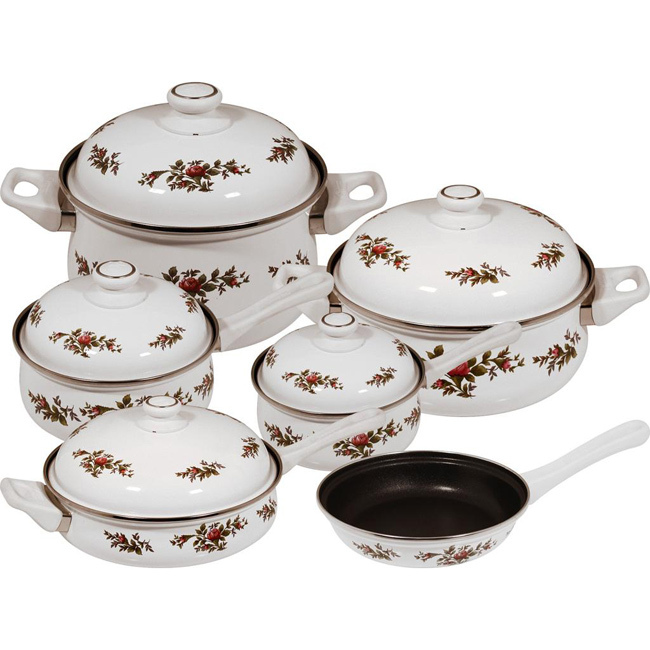 If so, and even if not, you will be reminded of summer gardens when you do your food preparation planning and cooking using these attractive steel pots and pans__the Magefesa 11-Piece Moss Rose Enamel on Steel Cookware Set. The assortment of sizes offers you a nice choice when using these pieces as saucepans, pasta pots, stock pots, saute pans or covered casserole dishes. Enough cook pans to prepare a complete meal and go from oven or stovetop to table top. Try this very different look for your kitchen! Enamel on carbon steel Offers stain resistance as well as chip and crack resistance. Enamel surface Is easy to clean and offers serving your family from the patterned pans at the dining table. Oven safe To a maximum temperature of 662 degrees F.
Dishwasher safe For quick clean up. Finished rim edges Are stainless steel for an attractive, polished look. Long handles Are cushioned for easy grasping and do not absorb heat. Patterned design Offers a different look for kitchen cookware.